The handiest piece of equipment you may ever own on a farm is a winch … and not necessarily for the reasons you think, writes Tom Dickson. The vehicle-mounted winch was designed as a means of recovery in the event your or someone else’s vehicle became stuck, bogged or just simply didn’t have enough grunt to climb a steep incline. A rock stuck between a tractor’s dual wheels can cause irreparable damage in a very short time. You would probably try to bash it out with a hammer, which takes a lot of time, energy and skin from your knuckles. An easier and quicker method is to wrap the winch cable around it and simply pull it out. The same can be applied to rocks stuck between the discs and tines on cultivation equipment. Strain up ringlock and wire netting on fence lines, straighten gateposts so the gate swings properly and pull a bent tine back into line. It’s even possible to pull a steel post out of the ground by nudging up to it and attaching the cable to the base of the post. This will give you about 30cm of lift. Pull up the underground pipes of a windmill by looping the winch cable over a pulley at the top of the mill tower. Hitching up a multiple rollers to a towing frame can be a tricky, time consuming task but threading the winch cable through the draw bar on the frame and attaching it to the hitch point on the roller pulls the two ends together for easy connection. This is a perfect example of a winch turning a two-man job into one you can do on your own. Every livestock owner knows the mess you can get yourself into dragging livestock out of the sticky mud surrounding a drying dam. A winch and a harness have the job done within minutes and you don’t get covered in mud. I have even used a winch to assist cows with the delivery of their calves when they couldn’t get the job done on their own. With a little bit of imagination and ingenuity you can let the winch do all the hard work. First and foremost, make sure you have enough pulling power to get your vehicle out of a sticky situation. You can choose the brand but get some advice and don’t be afraid to spend a few extra dollars for quality. Prices start from as little as $300 or $400 for a cheap unit, with better-quality ones going up to around $1500 to $2000. The guys at Umhauers, who specialise in 4WD accessories, recommend a 5670kg/12,500 lb unit as a minimum for farmers because the weight of the farm ute itself can often be around 3500kg. 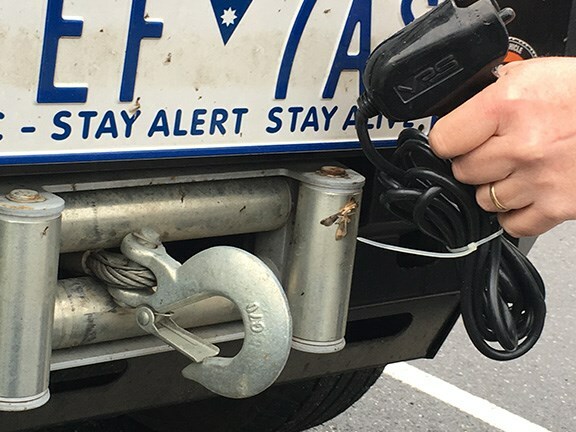 The key to maintaining complete control and accuracy comes from buying a winch with a plug-in or wireless remote so you can operate the winch from outside the vehicle.